The publisher hints at far-future trends. In an earnings call yesterday EA executives discussed long term planning for cloud-based services and streaming delivery services. Though streaming services such as OnLive have floundered execs and forecasters are increasingly talking about streaming as a key 'disruptive' force in the coming decade. According to Seeking Alpha's transcript EA CEO Andrew Wilson says "cloud gaming will enable games to reach new audiences and geographies, and we're continuing development on the streaming capabilities we debuted in June and exploring the disruptive combination we see for streaming with our industry-leading subscription services." "We are planning for the future," he adds in a Q&A later in the call. "We see a world where games are no longer bound by device or CPU or GPU. We see a world where they span across platforms, across business models, across geographies." Rumours of a new console generation in the next few years suggest that a streaming future should be quite a way off. Should it arrive it will have complex implications for PC gaming, and will put further strain on the idea of what it means to 'own' a game. 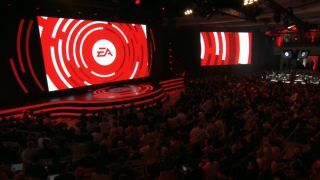 EA has leaned further into live games and subscription services in recent years. According to this earnings call we can expect more of the same in Battlefield V's 'living game' updates and Bioware's shared world shooter, Anthem. I'd never want to move to a world where I can't have a game installed on my hard drive, but there are positives. Decent cloud tech could let us continue our games on mobile and transfer progress easily between devices, and it could break down the barriers between communities on different platforms, letting more people play together. Either way, it's a trend worth watching in the next few years.